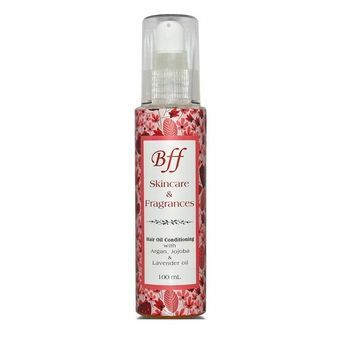 Packed with all essential vitamins, proteins and minerals, BFF Conditioning Hair Oil is one trusted product that can be used for improving blood circulation and hair growth. This conditioning treatment uses the essence of several natural ingredients to nourish and strengthen hair, making it defined and beautiful. This easy to apply oil fights all problems related to hair, like split ends, hair fall, frizz and other damages. Argan Oil: The active natural ingredients in Argan oil are impressive, and include, Phenolic antioxidants, Essential fatty acids, Omega 3, Omega 6 and Omega 9, Proteins and Vitamin E.
Jojoba: Packed with almost all of the vitamins and minerals essentially needed for healthy hair, vitamin E, B-complex, copper, zinc, selenium, iodine, and chromium. Composed of 98% mono-unsaturated fats and 2% saturated fats, it can penetrate the hair follicle and strengthen hair. Lavender Oil: Nourishes hair, Moisturizes scalp and strands, Helps prevent shedding hair, Improves blood circulation on the scalp aiding in hair growth and has powerful antiseptic qualities.